So asked designer Laurence Llewelyn-Bowen in a tweet yesterday, no doubt confirming the Shard, in the minds of some at least, as a latter-day Tower of Babel, an idolatrous monument to the wealth, power and inventiveness of humankind. Although I didn’t manage to swing an invitation to that particular party, I was fortunate enough to win tickets to the Shard on this, its opening day. As you read this I may well be standing on its 244m (800ft) high viewing platform and – weather-permitting – marvelling at the latest view of the incredible city I am privileged to call ‘home’. It is indeed easy, when considering such a structure and the city it graces, to see only our own capabilities reflected back to us, to praise the people who made it possible, and to take it as further proof that we have evolved beyond any need for God. But that is only one way to look at it. A few months ago I was walking in south London on a beautiful clear, sunny day. 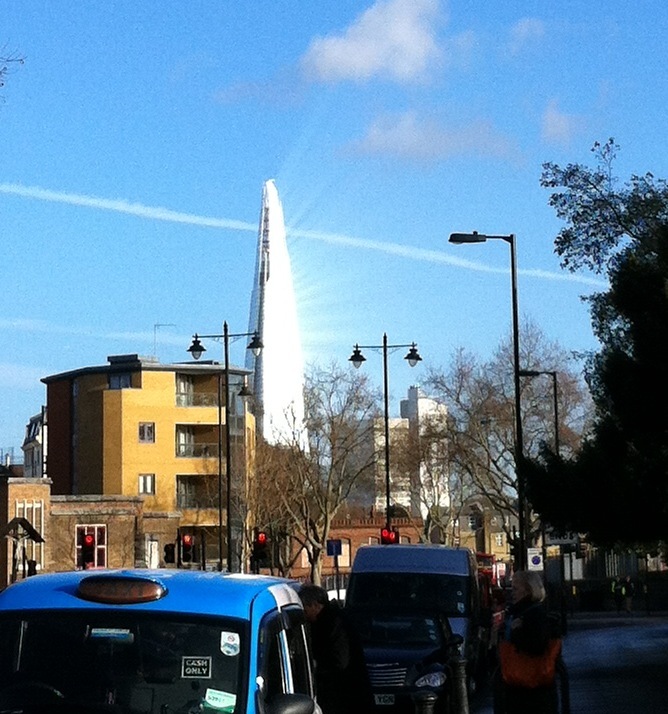 I looked up and saw that not only was the Shard bathed in sunlight, but it was reflecting the sun in visible beams of light. The only response I could make was to burst out in a song of praise. Men and women might have planned, designed and built the tower, but only God could use it to reflect such a glorious sun burst. More amazing still is that God would choose to ‘come down’ and inhabit not the high towers and glorious palaces, but the lowly manger, the grimy streets and the humble hearts. The glitterati may look down tomorrow and esteem themselves higher even than God, but those who have eyes to see will notice that above them shine stars and planets beyond number, flung there by the greatest architect and designer of all. ‘The heavens declare the glory of God’, and whether we know it or not, we can but mimic the mighty works of his hands. In the News: Christian beliefs harmful to children? Beautiful, Jennie just beautiful. I LOVE your writing. I am so glad you wrote that. I really love London, but sometimes I think it’s beauty is just man made, which troubles me slightly. When I go to the Lake District, or the beach, or the local downland I see God’s handiwork and it’s stunning. It makes me think “I lift up my eyes to the hills. From where does my help come from? My help comes from the Lord who made heaven and earth” Ps 121. Ah, thank you, Judith! Nature doesn’t often do that to me, but cities do – and London especially – day after day! and of course there is another challenge in 2Cor 3 v 18 “And we who with unveiled faces all reflect the Lord’s glory”! good post, and nice picture as well – it can be really tough at times to capture light effects like this! Thanks Jon, yes, I was really pleased it came out. Good old iPhone!